Soak seeds for 2 hours in warm water before planting. Sow from March to April under glass, or in a propagator at temperatures above 16°C (60°F). Once the seedlings are large enough to handle, transfer them into 9cm (3½in) pots of multipurpose compost, maintaining minimum night temperatures of 15°C (60°F). Seeds can also be germinated in the airing cupboard – put the pot in a polythene bag, check daily and remove the pot as soon as germination takes place. 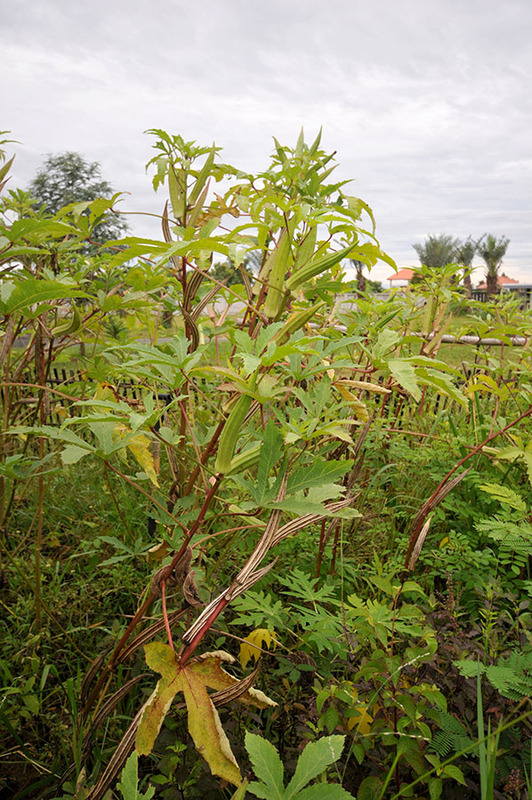 Four or five plants should produce enough okra for most families. In the UK plants are best grown in containers under cover in a glasshouse or polytunnel. Plants may grow well in containers on a warm, sheltered patio. Transplant into 23-25cm (9-10in) pots, growing-bags or into the glasshouse border from late May to early June, when plants are 10-15cm (4-6in) high. Water using tepid water, to keep the compost moist. Plants growing in containers need watering more frequently – check them twice daily during warm summer weather. PInch out growing tips to encourage bushiness. Feed weekly with high potassium fertiliser, once the first flowers have formed. Glasshouse red spider or two spotted mite: Leaves become mottled, pale and covered in webbing, on which the mites can be clearly seen; leaves also drop prematurely. Remedy: They thrive in hot, dry conditions, so mist plants regularly. Use biological control in the greenhouse. The pods should be picked (cut with a knife or secateurs) while they are tender and immature (5-10cm/2-4in) long for most cultivars. This can be any time from July through to October. They must be picked regularly. Large mature pods of many varieties are tough and stringy. 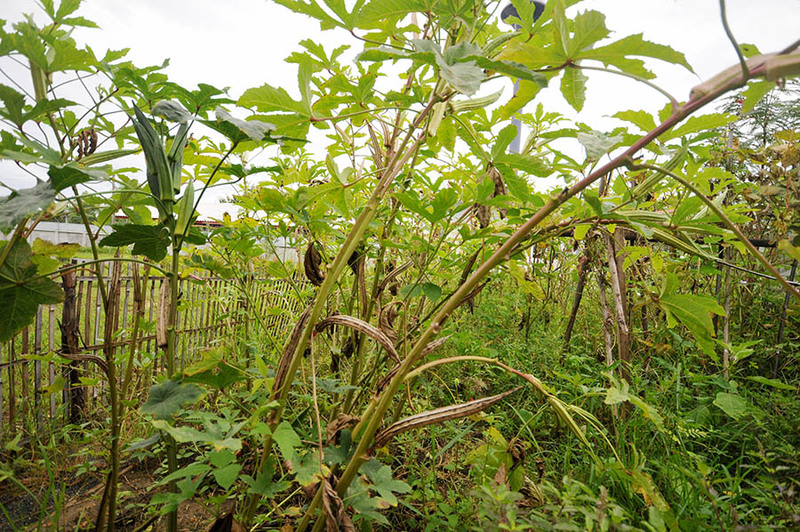 Okra plants have short hairs that may irritate bare skin, so wear gloves and long sleeves when harvesting – or touching the plants. Handle pods gently as the skin is easily marked. Plants produce pods until temperatures drop in autumn, often until the first frosts. Pods can be frozen for winter use. ‘Clemson’s Spineless’:A popular, high yielding variety with a long cropping season that grows well under cover. ‘Burgundy’:Has attractive deep red pods which remain tender, even when large. The leaves, stems and branches are also red. ‘Emerald’:Prolific with deep green pods on tall plants. 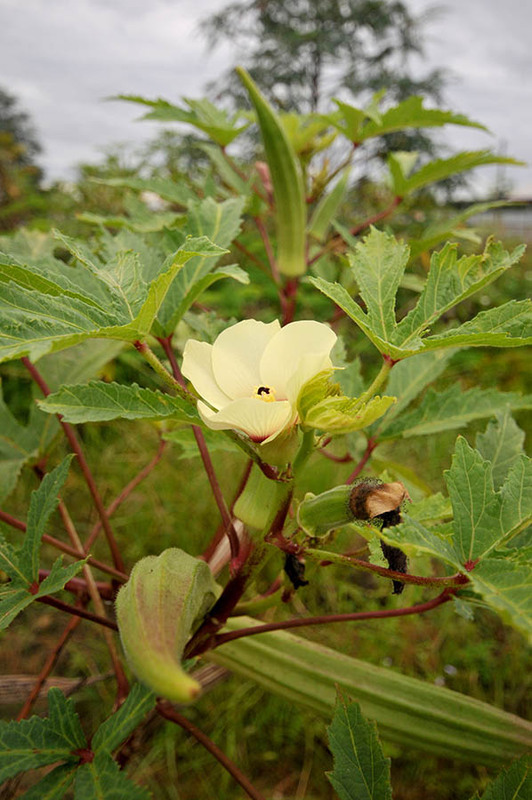 Sorry just daft I know – anyhoo – Okra we grow loads of the stuff – there seems to be two types one is low growing to about 3 ft in height and there is this stuff that grows to about 7 feet. – OK this is the tropics and all we do is throw the seeds in the ground and up they come.You can see all the seed pods brown formed up. Anyone want any seeds let me know – but im not sure how they will grow in your winter. What a beautiful flower -- almost like a cistus.